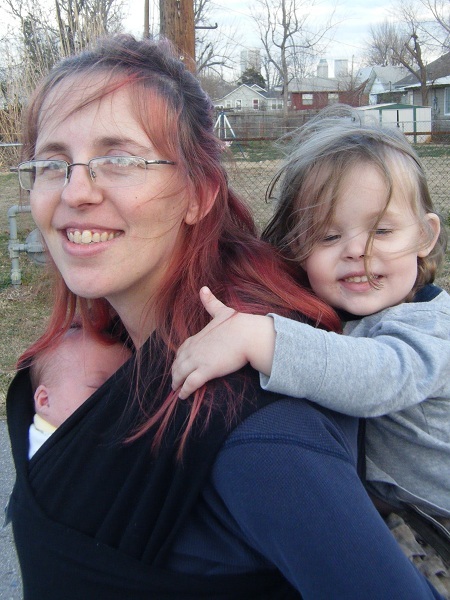 Jennifer at Hybrid Rasta Mama shares "Babywearing for Newbies: Types of Carriers." This comprehensive post explores the myriad of babywearing options and the strengths and limitations of each. You can also find Hybrid Rasta Mama on Facebook, Twitter, Pinterest, and Networked Blogs. Momma Jorje shares "Boba Carrier Review." Read her opinions on the features Boba offers. You can also find Momma Jorje on Facebook and Networked Blogs. Ever wondered what baby carriers were good for hip carries, and at what ages and stages a hip carry is best? Dionna of Code Name Mama shares "Hip Carries for Every Age and Stage" and "Baby Carriers Appropriate for Hip Carries of Infants and Beyond" - both are filled with excellent information from Steffany Kerr, a Master Babywearing Educator for Babywearing International. You can find Dionna on Facebook, Twitter, Pinterest, and YouTube. Julia at A Little Bit of All of It shares "The Moby Wrap." This post describes her experience with this popular stretchy wrap as part of her Babywearing Series and includes an opportunity to win your own! You can also find A Little Bit of All of It on Facebook, Twitter, Pinterest, and Networked Blogs. Julia at A Little Bit of All of It shares "Wearing Baby Safely." All you need to know to safely babywear is summed up in nine points in this first post of her Babywearing Series going on this fall and winter. You can also find A Little Bit of All of It on Facebook, Twitter, Pinterest, and Networked Blogs. Erica at ChildOrganics shares "Safe Babywearing." This discusses the CPSC warning of certain baby carriers and how you can wear your baby safely. You can also find ChildOrganics on Facebook, Twitter, and Pinterest. Wondering how to nurse in your new carrier? Check out tips and tricks in a series of posts Dionna of Code Name: Mama published at NursingFreedom.org. She touches on Breastfeeding While Babywearing in a Mei Tai, in stretchy wraps, in a ring sling, and in soft structured carriers. Lauren at Hobo Mama offers a video tutorial on "How to breastfeed while babywearing in a mei tai," making it easy to nurse hands-free and feed your little one discreetly on the go. You can also find Hobo Mama on Facebook, Twitter, Pinterest, and Google +. Momma Jorje shares "Wordless Wednesday: Mei Tai." Follow her process of making her Ball Baby Mei Tai. You can also find Momma Jorje on Facebook and Networked Blogs. Amy at Anktangle shares a quick and simple tutorial for how to make your own no-sew stretchy wrap, one of the easiest and most inexpensive baby carriers to own. Bonus: with this tutorial, you end up with three wraps—one for you, and two to give away as gifts! You can also connect with Amy on Facebook, Twitter, Pinterest, and Google +. Spencer in a Moby, Sasha just piggy-back. Lauren at Hobo Mama issues a "Call to persist in babywearing." Even our kids who can walk on their own appreciate being snuggled and carried next to us. You can also find Hobo Mama on Facebook, Twitter, Pinterest, and Google +. Shannon at The Artful Mama gives her recommendations for "Babywearing While Pregnant" and tells us why "Breastfeeding and Babywearing - It's Awesome!" You can find her on Facebook and Twitter as The ArtsyMama or in her Cloth Diapering Consultant role at Diaper Parties by Shannon on Facebook and Twitter. Lyndsay at Our Feminist Playschool shares "Goodbye to BabyWearing." This is a post documenting Lyndsay and Aodhan's years of babycarrying in tribute of their last carry! You can also find Lyndsay on Facebook, Twitter, Pinterest. Amy at Me, Mothering, and Making it All Work shares "Why We Wear Our Babies." Amy has enjoyed wearing both of her children and talks about the carriers she's used and the benefits of babywearing she's experienced. You can also find Amy Willa on Facebook, Twitter, and Pinterest. That Mama Gretchen shares her post "Close to My Heart", a brief reflection on her babywearing journey. You can also find That Mama Gretchen on Facebook, Twitter, and Pinterest. Cynthia at The Hippie Housewife shares "My Little Kangaroo." This photo-heavy posts detais the author's personal experiences with babywearing, including ring slings, mei tais, and wraps. You can also find The Hippie Housewife on Facebook, Google+, and Pinterest. Jennifer at Hybrid Rasta Mama shares "Babywearing Around The World." This is a photo essay highlighting traditional babywearing options from all over the globe. You can also find Hybrid Rasta Mama on Facebook, Twitter, Pinterest, and Networked Blogs. Lyndsay at Our Feminist Playschool shares "Daddy BabyWearing." This is a wordless post that follows her son being carried by his papa! You can also find Lyndsay on Facebook, Twitter, Pinterest. Luschka at Diary of a First Child shares "A Sling is a Wonderful Thing." In this post she shares her first experiences with and love of babywearing her first child. You can also find Diary of a First Child on Facebook or Twitter. 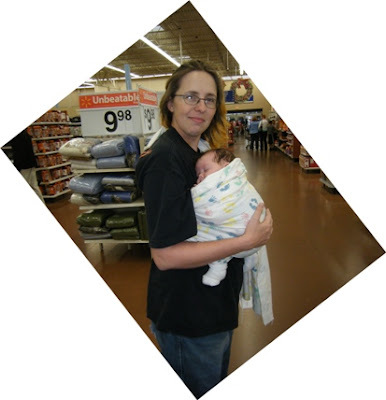 Cynthia at The Hippie Housewife shares "Attachment Parenting Series: Babywearing." Describing the ways in which babywearing and attachment parenting are related, this series installment includes benefits, styles, uses, and alternatives. You can also find The Hippie Housewife on Facebook, Google+, and Pinterest. What is the safest way to carry a baby in a carrier? What have studies shown about the benefits of keeping baby close? Discover these answers and more in Beyond Bonding: The Power of Positioning in Babywearing at Natural Parents Network. 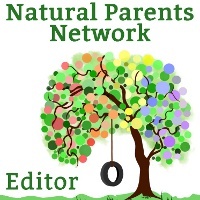 Connect with thousands of parents who practice attachment parenting and strive for a healthy, eco-conscious lifestyle through Natural Parents Network on Facebook, Twitter, and Pinterest. Mandy at Living Peacefully with Children shares "A Ride on Mother's Back." Not many children's books on attachment parenting exist, but Emery Bernhard's book, A Ride On Mother's Back, is a lovely book for children and caregivers alike. You can also find Living peacefully with Children on Facebook. Jennifer at Hybrid Rasta Mama shares "The History of Babywearing." Come on a global journey and learn a brief history of babywearing. You can also find Hybrid Rasta Mama on Facebook, Twitter, Pinterest, and Networked Blogs. 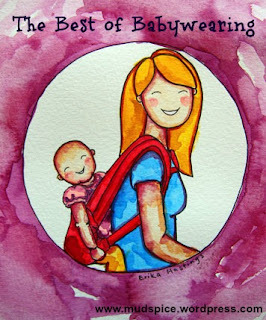 A special thank you to Erika Hastings of the blog Mud Spice for creating and sharing her babywearing art with the world!